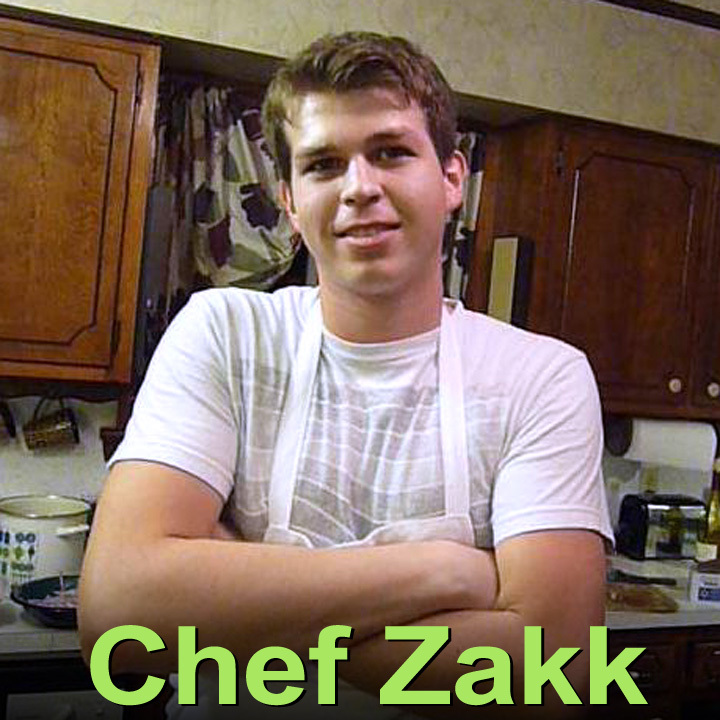 Cajun Chef Zakk is back and I got the recipe video to prove it ! Cheffing runs in the family and my young buck of a nephew is a chip off the cutting board block. You know what I'm talking about if you are a 99 Cent Chef follower -- if not, then just scroll down a little bit and look to the right and enter your email address in the "Follow by Email" window, to keep up the the Chintzy Chef's family antics. Every time I go back to Gonzales, Louisiana to visit the Cajun side of the family, it's always a good-time cooking party when I get together with my chef relations. If you don't believe me then just click on any of the following cooking videos I've made with my brother-in-law Chef Tony, nephews Chef Matt and his younger brother Chef Zakk. And here's their recipe videos thus far, including: Crawfish Etouffee, Fried Alligator Po'Boy, Blackened Fish with Sweet Potato Hash, and Shrimp and Cheese Grits. Now you can add one more recipe, Chef Zakk's Tuscan Primavera with Angel Hair Pasta. For Chef Zakk's latest recipe it's pasta done Cajun Style. Don't worry, you can live anywhere and make this veggie loaded Italian entree. Actually they, along with the French and African early settlers, have a strong culinary influence on Louisiana cuisine. You can check out my Cajun Muffaletta Sandwich recipe here to see what I mean -- it's just a huge Italian deli sandwich. As for preparation it's just some veggie chopping and sauteing. 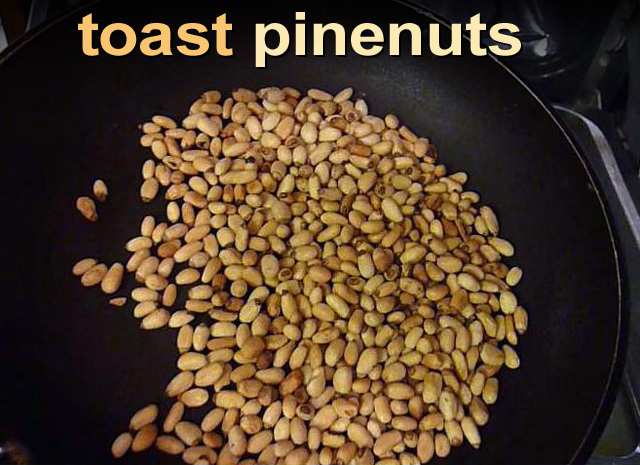 The most complicated part is easy: toasting the pine nuts for a few minutes in the oven. 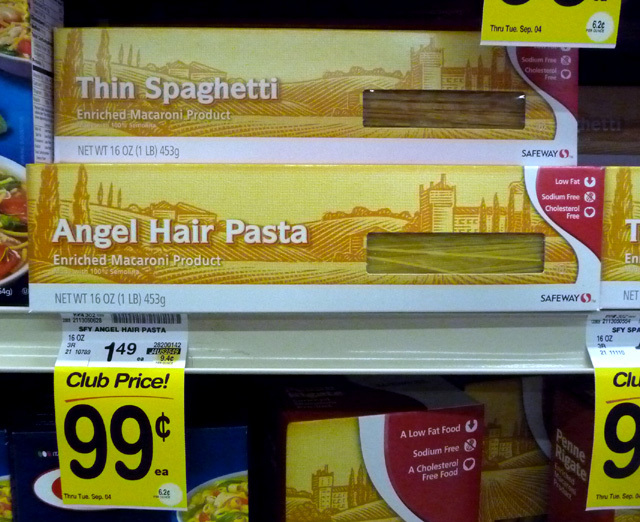 Chef Zakk used Angel Hair pasta, but you could use any favorite you find on sale. 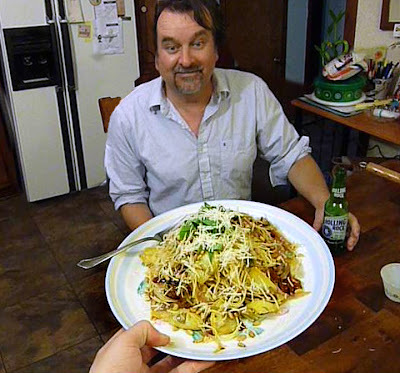 So kick back and check out Uncle Tightwad's latest recipe video, Chef Zakk's Tuscan Pasta Primavera. And be sure to notice Chef Zakk's slicing and chopping skillz, I even learned a few things. Play it here. Video runs 8 minutes, 36 seconds. 1 whole red onion - julienned, about 2 cups. 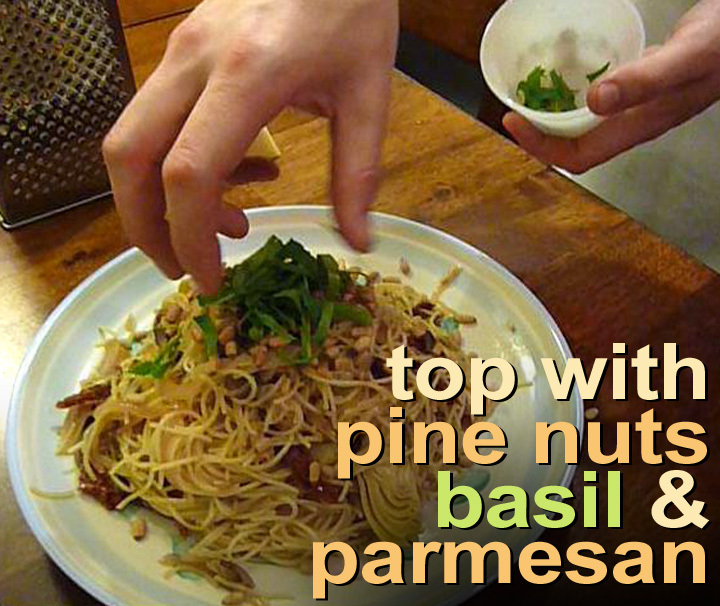 1/2 cup of pine nuts - okay to substitute with any cheap nuts. 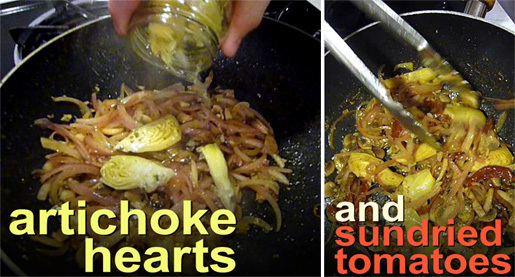 Small jar artichoke hearts - in oil and/or vinegar, drained. Okay to use canned in water. Whatever picked veggie you can find cheaply can be used. 2 cloves garlic, minced - or 1 tbsp. from jar. 1 tablespoon Cajun (Creole) Seasoning - Chef Zakk used Tony Chachere's. You can use any cheap generic Cajun spice blend. 1/4 stick of butter - okay to use 2 tablespoons to 1/4 cup of olive oil. 1/2 cup white wine - Chef Zakk used Chardonnay. 3/4 package of Angel Hair pasta - okay to use any pasta you have on hand. Video shows 1 package, but I found that too much. Preheat oven to 350 degrees and start a pot of water to boil. Add 3 shakes of salt and a tablespoon of olive oil to the pot of boiling water. Cook pasta al dente (I usually shave off a couple of minutes from package cooking direction time. 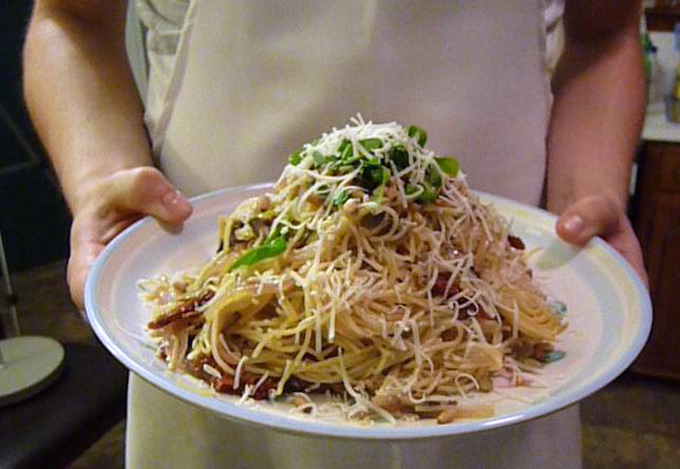 Drain and rinse pasta (to stop cooking) and set it aside. 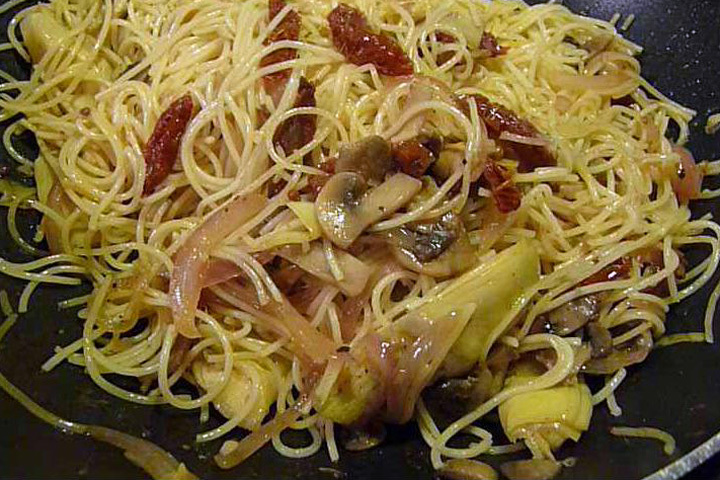 Drizzle on a tablespoon of olive oil, lightly mix pasta so it doesn't stick together. Saute a 1/2 cup of pine nuts over a medium/low heat in a pan about 2-4 minutes, until lightly browned. Move pan to oven and toast an additional 3-5 minutes at 350 degrees. Now time to cook the veggies. Add a 1/4 stick of butter (or olive oil) to a medium heating pan. When butter is melted add minced garlic, julienned red onion, and sliced mushrooms. Salt and pepper to taste then add a tablespoon of Cajun Seasonings (okay to leave out salt, as Cajun Spices have plenty.) 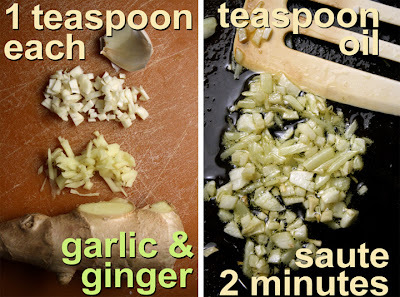 Mix all ingredients and saute about 2-4 minutes. Next add drained artichoke hearts and sliced sun-dried tomatoes to the sauteing veggies. Heat through for a couple of minutes then add the cooked pasta. Pasta just needs to cook with the veggies a couple of minutes to reheat. Mix well. Pour in a half cup of white wine. Cook for a couple of minutes to reduce the liquid. Finally mix in the half of the sliced basil leaves. Time for plating. 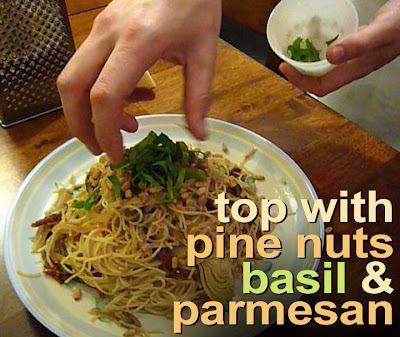 Add a serving of pasta to the plate and top with some pine nuts, sliced basil and shaved parmesan cheese. 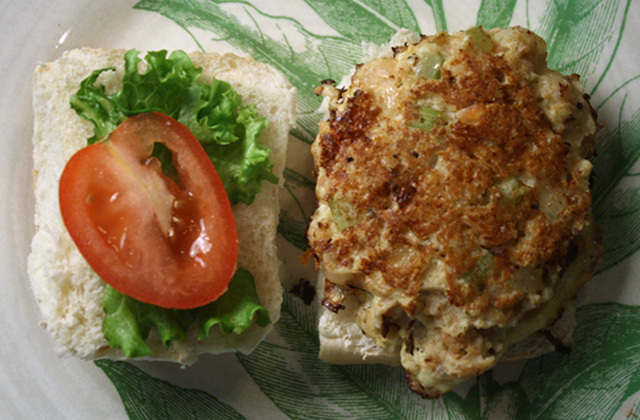 Shrimp is not only a crustacean, but is a term used to define small, and my latest recipe combines both -- bite-sized Shrimp Sliders loaded with seafood flavor. It's a convenient and quick way to make a uniquely savory sandwich. With this recipe I made 3 mini seafood burgers, which is quite a large serving. Get a few packages of bay shrimp and you can feed a small party. Of course you can use regular sized shrimp -- you just need to chop or mince in a food processor or blender. 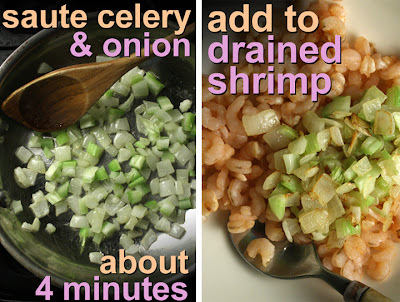 Since shrimp cook quickly, raw shrimp can be used with this recipe, too, just add a couple of minutes of saute time. You are basically making a shrimp meatloaf like mixture with: sauteed veggies, breadcrumbs, some mayo and 1/2 of an egg. I seasoned the shrimp mixture with salt and pepper, but you could kick it up a notch with Cajun spices, or a favorite spice/herb blend. I always find small 4 ounce packages of teeny cooked and frozen bay shrimp for a dollar. 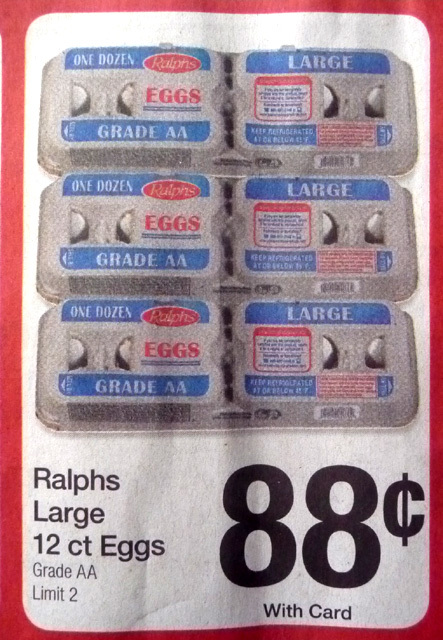 My local Albertsons chain grocery stocks them in the frozen deli case, and I often find them in 99c only Stores, too. So for a fun party platter serve my Shrimp Sliders -- or if all you have is a 4 ounce package of shrimp then my recipe below for 3 sliders feeds one fully, no problem. 4 ounces shrimp - I picked up a dollar package of cooked bay shrimp. You can use uncooked too. 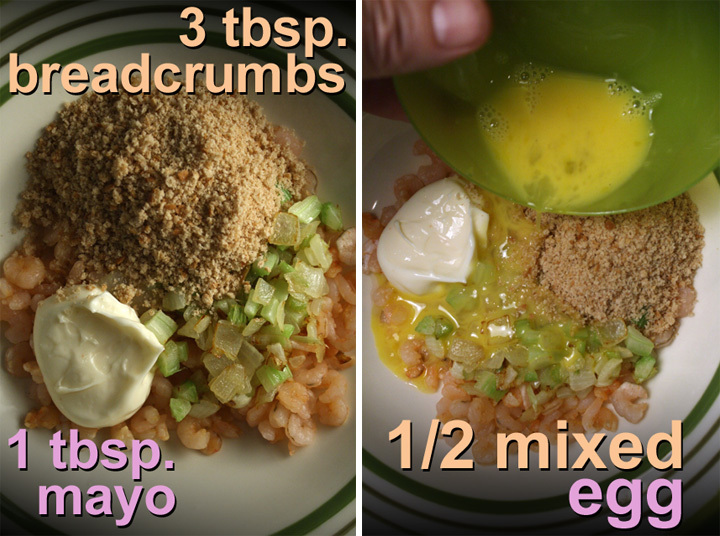 3 tablespoons of bread crumbs - or 1/2 slice of bread fine chopped or blended. 2 tablespoons of fine chopped onion - any type. Many recipes call for green onion. 1/2 small or medium egg - well mixed. 3 tablespoons of oil - for frying veggies and shrimp patties. 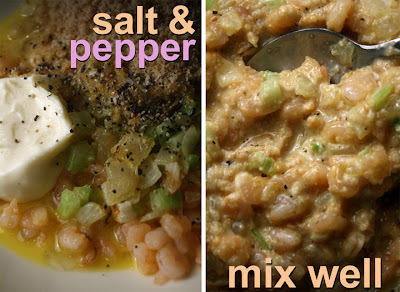 Start with a tablespoon and add more if you need to for each shrimp patty. 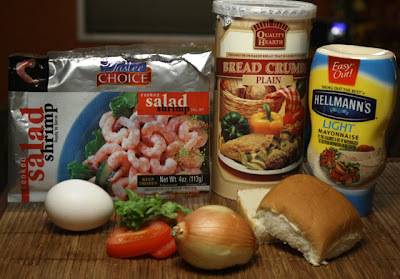 3 small dinner rolls - Or you could make one or two large shrimp patties for Shrimp Burgers. Dress the Shrimp Sliders with you favorite sandwich ingredients, including: lettuce, tomato, pickles and mayo, ketchup or mustard. In a medium sized frying pan add a tablespoon of oil over a medium heat. Add chopped onion and celery. Saute about 2-4 minutes until tender. 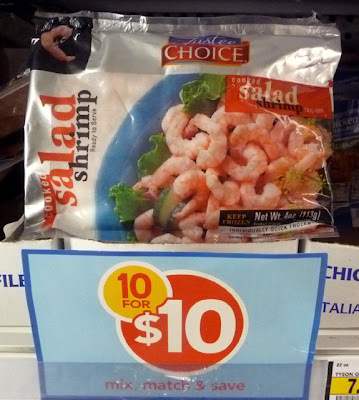 In a medium bowl add defrosted bay shrimp. (You may need to drain them first.) If you are working with larger shrimp, then roughly chop them to about green pea sized. Okay to pulse in a blender. Mix the ingredients together. 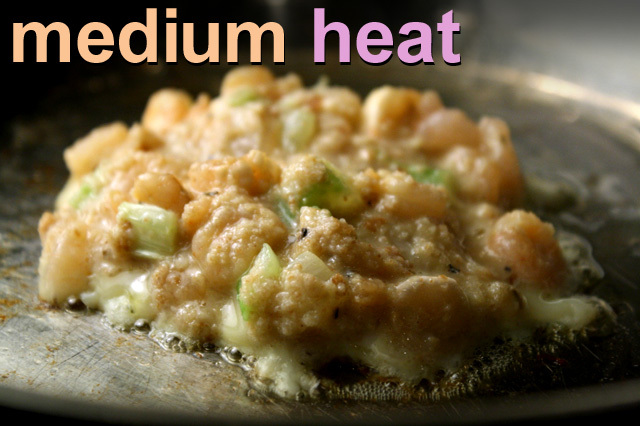 Add a tablespoon of oil to a low/medium heating frying pan to cook the shrimp patties. Add more oil as you need it. You want to make the patties about the size of your small dinner rolls. 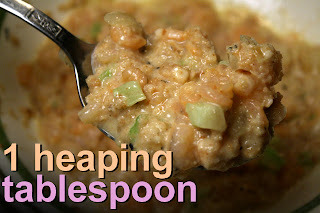 I used a tablespoon and got a heaping amount,scooping it into the heating pan. Let the shrimp patty cook for about 3-5 minutes. But do check the cooking edges during the last couple of minutes -- you don't want to burn the patties. You can peek under the patty after a couple of minutes; you are looking for a golden brown color. Turn the patty over and continue cooking for another 2-3 minutes, until the liquid is cooked out. You can make a small slit into the top to check. While shrimp patties are cooking you can slice the tomato and get out the slider toppings. When shrimp patties are done then assemble the sliders and enjoy. It's easy to double or quadruple the recipe for a gathering. 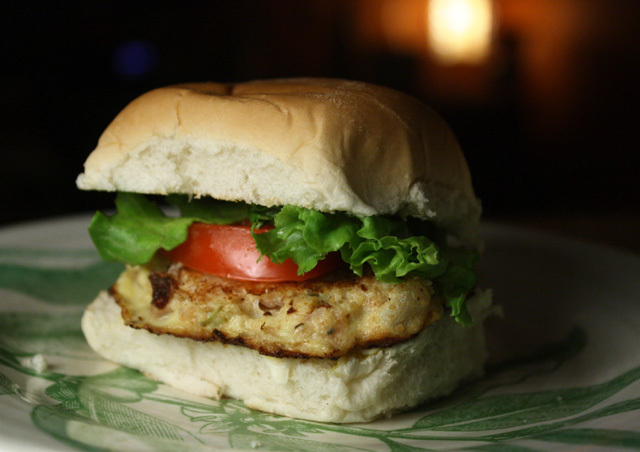 And if you are working with regular hamburger buns, then make one or two large shrimp patties. 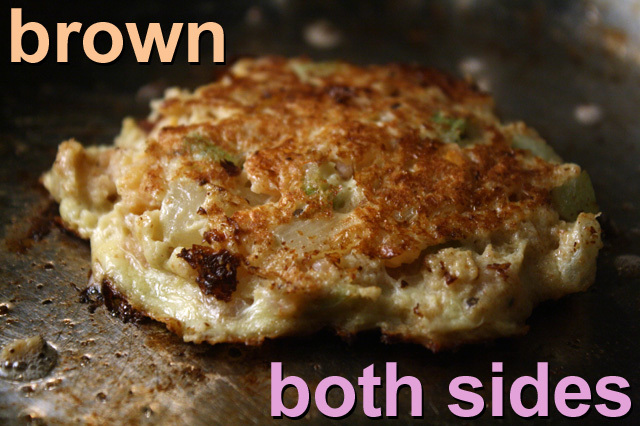 Try cooking one shrimp patty to see how it holds together. If is is too crumbly, then add another tablespoon of mixed egg for binding. 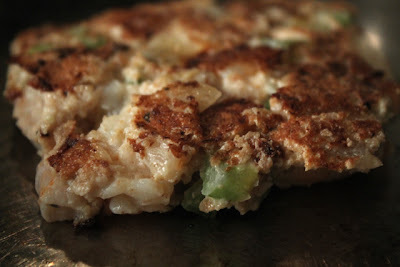 You could also chill shrimp mixture for a couple of hours to make patties bind better. I like a few chunks of shrimp in the patties, but you could pulse the mixture finer in a blender. A remembrance of breakfast past, from this Tex-Mex Tightwad Chef, was my grandmother Big Mama setting a big steaming bowl of Scrambled Eggs and Refried Beans and a stack of homemade flour tortillas in front of her brood of hungry grandkids. When I lived in the tiny seaside town of Port O'Connor, Texas, from 4th grade to 7th grade, there was nothing better than this on chilly school day morning. We lived with her for a short period of time, until my Mom got a job waitressing and we could afford to move out to our own place down the street. I was raised on simple comfort food. And you can't get simpler than Scrambled Eggs and Refried Beans. 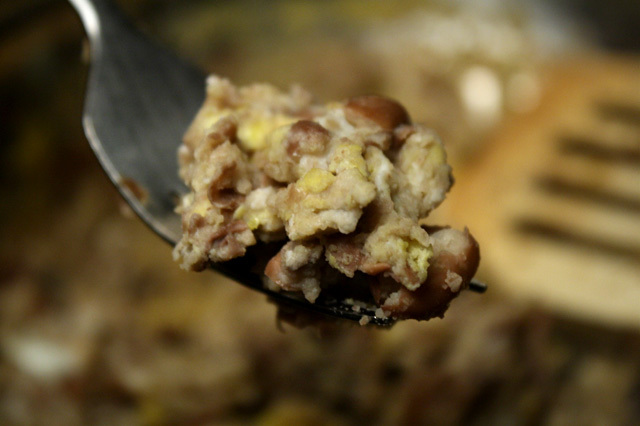 There was always a clay pot of fragrant pinto beans cooking at Big Mama's house. 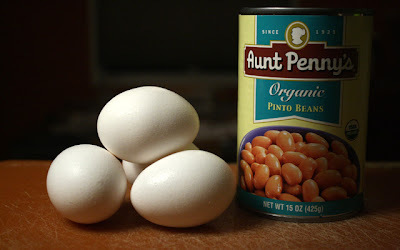 But you can use canned pinto beans, or any favorite legume including: black beans, black-eyed peas, lentils, white or red beans. And you can't get cheaper proteins than beans and eggs. 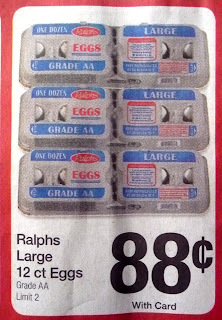 Canned beans are always on sale and I can still get a dozen eggs for a $1 or less. Sometimes I can even get large eggs, but can make due with medium. The cheapest way to go is with a package of dried beans. 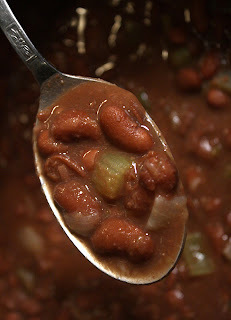 If you want to go for making a pot of your own beans then just check out my video below of Miss Patties Red Beans recipe - it's vegetarian (blogpost with text and photos here,) and for a soul food version just add a ham hock or a few slices of bacon. (This recipe is great for Navy or white, pinto and black beans - I also have a lentil bean recipe, just click here.) I like to keep a few Ziploc bags of frozen cooked beans in the freezer to use when I make my Mom's Mexican Rice recipe, which pairs perfectly and is just a click away. Whether you use canned or fresh cooked beans, the only prep you have to do is heat up half a cup in a teaspoon of oil, and mash them with a fork. 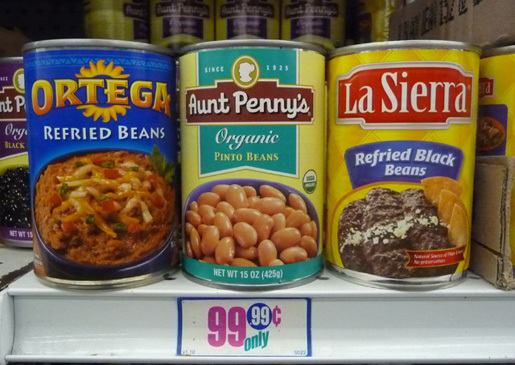 (I sometimes even find cheap beans already refried.) 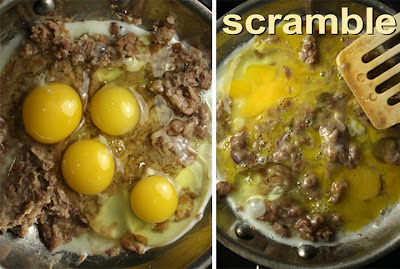 And you finish by scrambling in 3-4 eggs. It couldn't be simpler, and it's a hearty and cheap way to start the day. You can serve Scrambled Eggs and Refried Beans any way you like, with corn or flour tortillas (for tacos or burritos,) and even a bagel or English muffin. 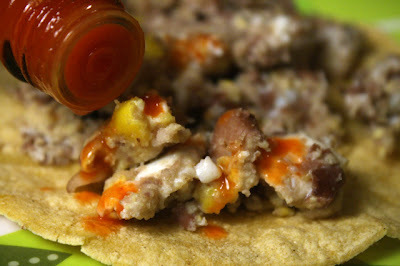 To kick it up a notch sprinkle on some of your favorite cheese, or add a scoop of my Pico de Gallo Salsa (recipe here.) And make sure to put out a bottle of hot sauce! 3-4 eggs - I used medium size. 1/2 cup of cooked pinto beans - you can use any favorite cooked legume. Pepper to taste - optional. Canned and cooked beans have plenty of salt for me, but you can add it to suit your taste. Serve with flour or corn tortillas - optional. Add a teaspoon of oil to a heating pan. Add the beans, along with a tablespoon of broth. Mash the beans with a fork (or potato masher) as they are heating through. It's up to you how mushy you want the Refried Beans - I like mine slightly chunky. This is how you make typical Refried Beans (but add extra broth so the beans don't dry out when reheating,) so you can make extra for any favorite Mexican meal. Just type in "Mexican" in the search window at the top left of this page (just above my dollar logo) to see some of mine -- and I have plenty. I start heating up the tortillas just before the eggs are added. Heat in the microwave or in another pan. 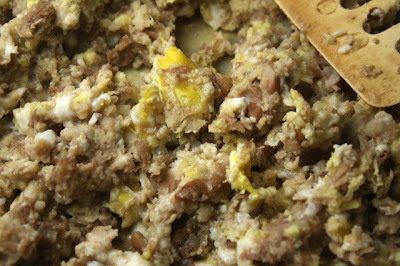 Once the beans are mashed and warm, mix in the eggs and scramble until firm. Season with extra salt and pepper if you want. You can use your favorite egg scramble ingredients and do it your way. 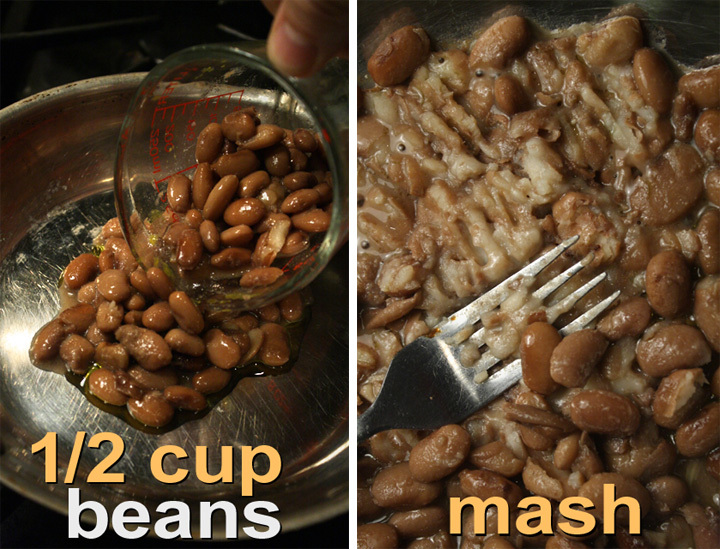 For extra creamy Refried Beans, just remember to add more bean broth, start with a tablespoon, but keep adding more, while mashing the beans with a fork (or potato masher) to reach desired creaminess. If you like more egg than beans then just reduce bean amount. Make this dish your own and tweak it your way. Tasting half way between celery and cabbage, leafy bok choy makes a crunchy and tender stir fry. And it steams quickly -- it's ready to eat in barely 5 minutes. 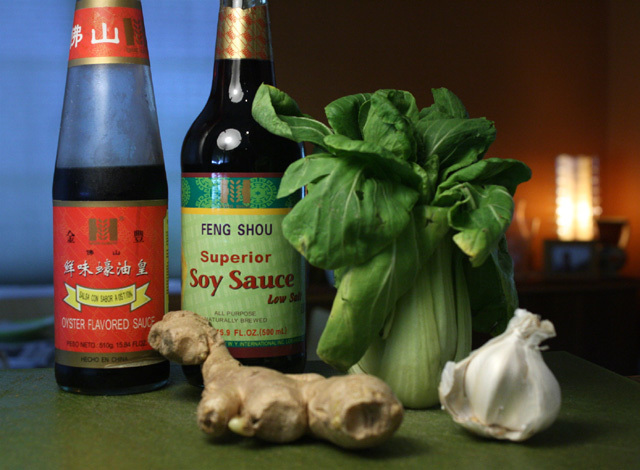 For my latest recipe I use my typical stir fry sauce of soy and oyster sauce. 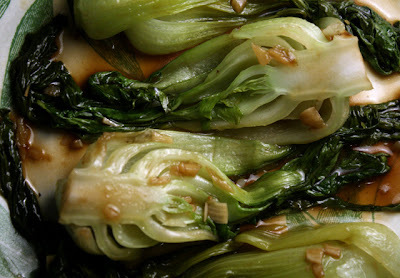 Bok choy has a subtle taste, but can handle intense Chinese flavors well. 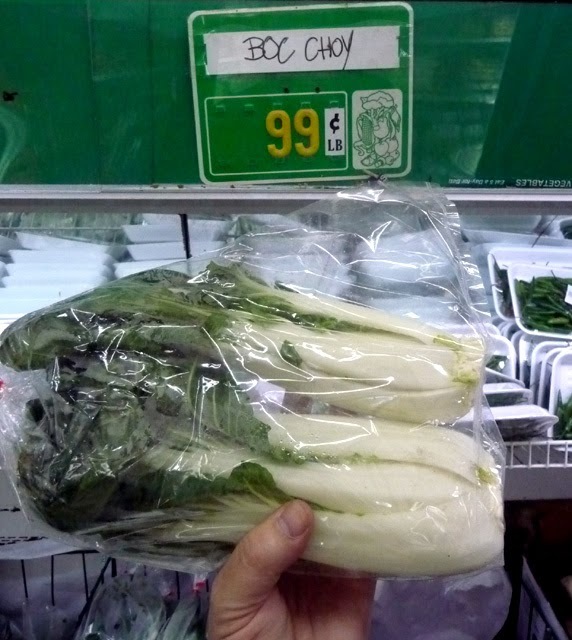 Bok choy is showing up more at regular chain grocery stores. I picked up bok choy cheaply at Bangkok Market on Melrose Avenue, in East Hollywood. If you are looking for cheaply priced Thai noodles, chile and fish sauces, herbs and veggies, this is a great market. So you now have another reason to visit your local ethnic food stores. You can read what Yelpers say about Bangkok Market by clicking here. Bok Choy can be simply steamed in water or a favorite broth, or made it the 99 Cent Chef stir-fry way. 1 1/2 pounds bok choy - about 3 to 5 whole ones, depending on size. 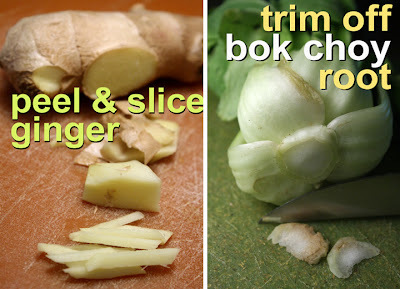 1 teaspoon chopped ginger - okay to use powered ginger. Sweetener - to taste, optional. 1 teaspoon oil - for cooking ginger and garlic. Pepper to taste - no salt necessary as soy sauce has plenty. Peel about a one inch square of ginger and slice into matchstick sizes, then chop. Peel and chop one clove of garlic. 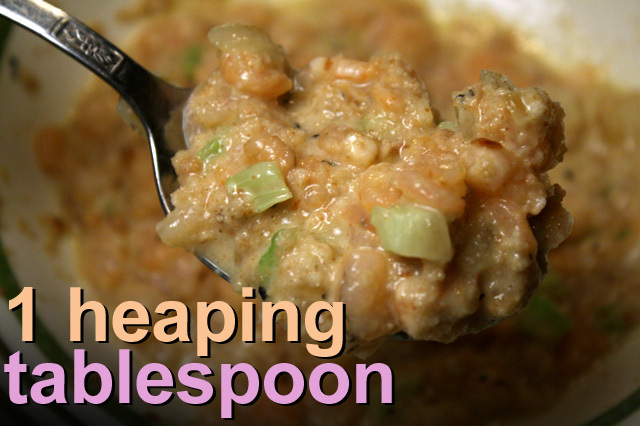 Total is about one teaspoon each. Fresh ginger has a paper thin skin that comes off easily by scrapping it away with a metal spoon. Heat 1 teaspoon of oil in a wok or pan over medium heat, and add chopped ginger and garlic. Saute for a couple of minutes - stop when garlic just starts to lightly brown. Carefully add 1/4 of water or broth. Trim off any tough and browned root end. Trim off any old bok choy leaves if necessary. 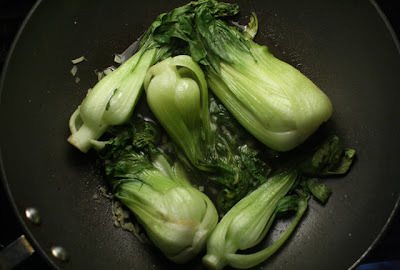 Okay to split each bok choy lengthways in half if you want to, to speed up steaming. 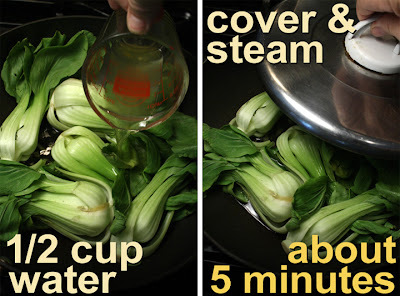 Add bok choy to water. Bok choy cooks quickly, so you only need to cover and steam it for about 5 minutes. 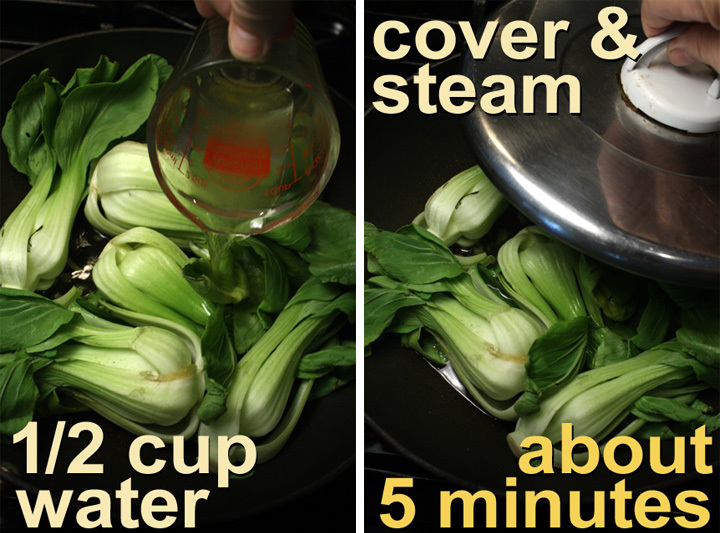 If the bok choy are on the small side, you can steam them uncovered. While bok choy are steaming make the stir fry sauce. Add soy sauce and oyster sauce to a small bowl. Sprinkle in 1 teaspoon of cornstarch, or flour, and mix until dissolved. Add a little sweetener (to taste) if you like. 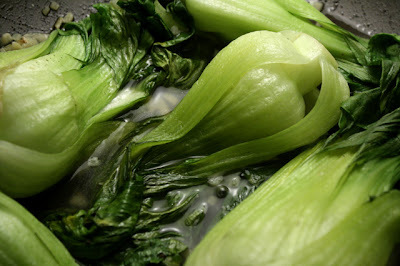 After bok choy is steamed tender push it to the edge of the wok and add stir fry sauce to steaming liquid, mixing well. After a minute or two the sauce will thicken into a gravy. 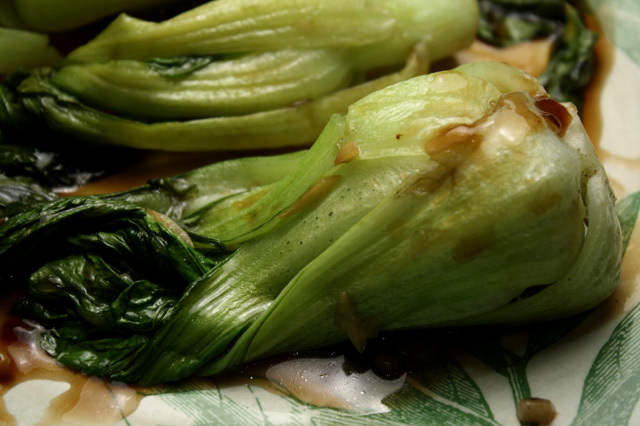 Coat bok choy with stir fry sauce and serve warm. If you don't have Oyster Sauce, try adding a small amount of your favorite sweetener, like a teaspoon of sugar or honey to easy-to-find soy sauce and cornstarch. 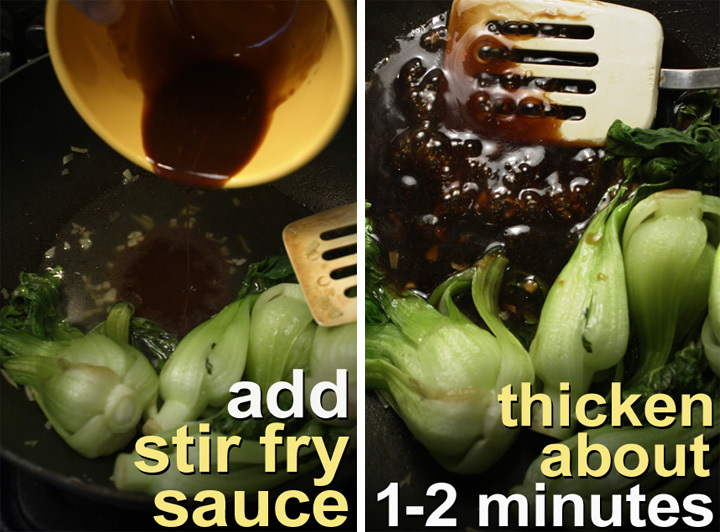 (Use 2 tablespoons of soy sauce.) If you have a favorite Teriyaki Sauce then use that. You could also leave out the ginger. For a couple of my Oriental recipes to pair the Bok Choy Stir Fry with, just click on the entree names: Sweet and Sour Pork or Japanese Pork Cutlet. My Mango Chutney is spiced with easy-to-get cumin and cinnamon. Sauteed onion gives it a bit more volume, and sugar with vinegar provide the pickling ingredients. 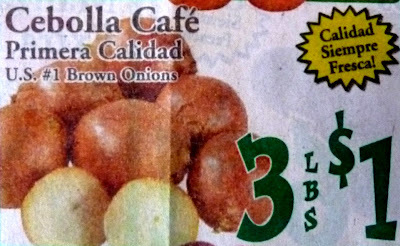 Living in California, I always find mangoes on sale, and onions are cheap at any grocery store. You could get an expensive curry powder or just go with what I use, cheap ground cumin. As I've mentioned in earlier posts, cumin provides 75 percent of a typical curry powder mix. You can add cinnamon if you have it -- apple pies are not the only cooked fruit that benefits from this eatable ground tree bark. 1-2 mangoes - remove peel and seed. About 1 to 1 1/2 cups of flesh. 1 onion - any type, chopped. 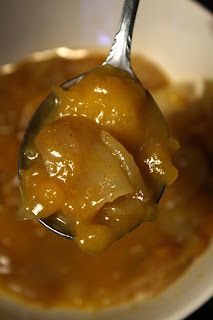 1/4 cup sugar - or favorite sweetener, like honey. 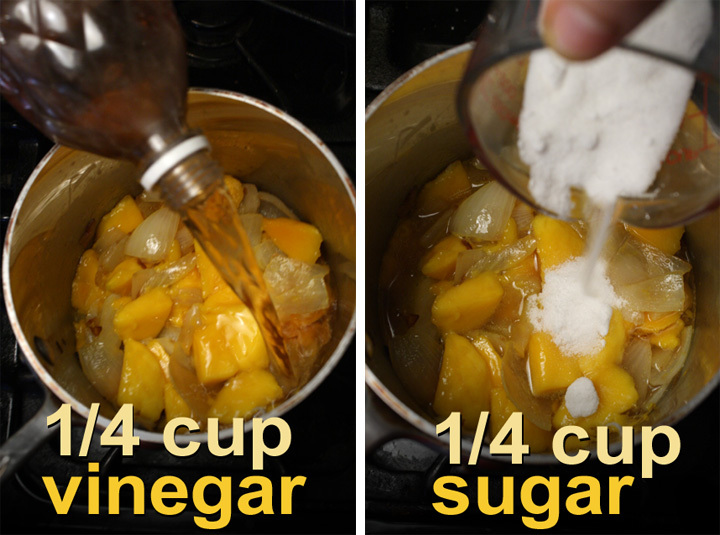 1/4 cup vinegar - white, apple, or rice. 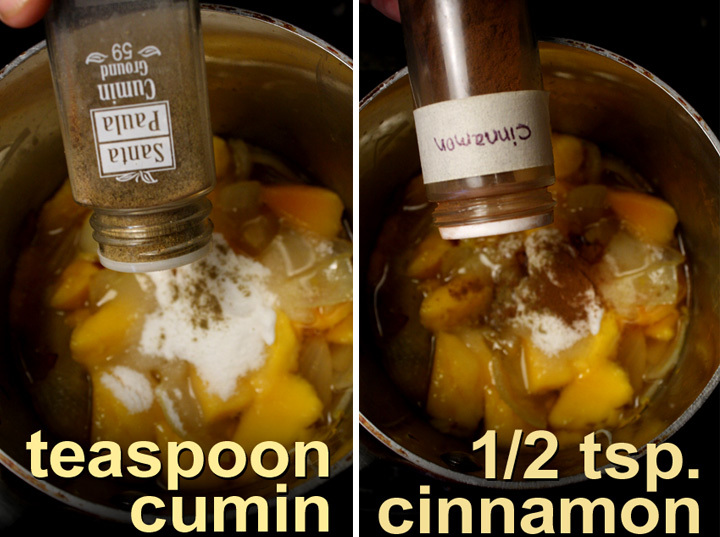 1 teaspoon ground cumin - or your favorite curry powder. 1 tablespoon cooking oil - for sauteing onions. Add 1 tablespoon oil to a pot over a medium heat. Roughly chop one onion. Add it to the pot. Stir occasional. 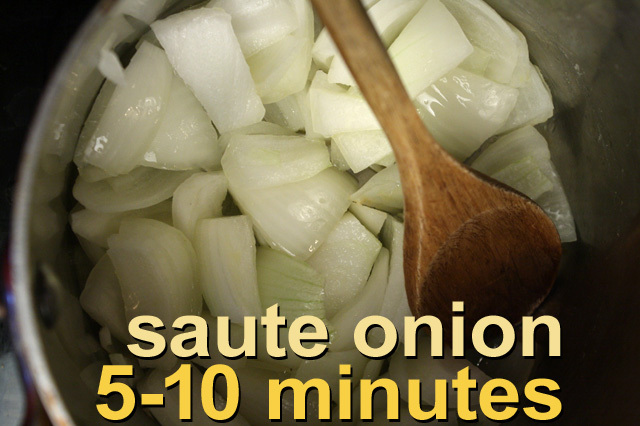 Cook until onion is soft, about 5-10 minutes. Peel and seed mango. I even scrape, with a spoon, any flesh left on the peels and seed. Slice into large chunks (about 1 to 2 inch squares.) Add mango to cooked onion. 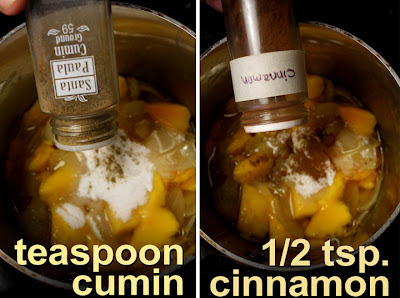 Add vinegar, sugar, cumin, cinnamon (optional) and a pinch of salt. Mix well. 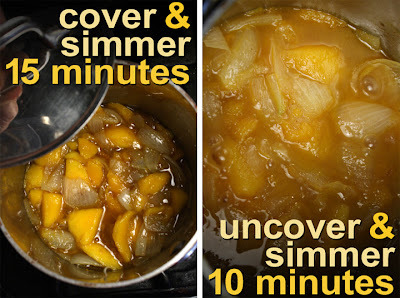 Bring to a simmer, reduce heat to low and cover. Cook 15 minutes. Stir every once in a while. 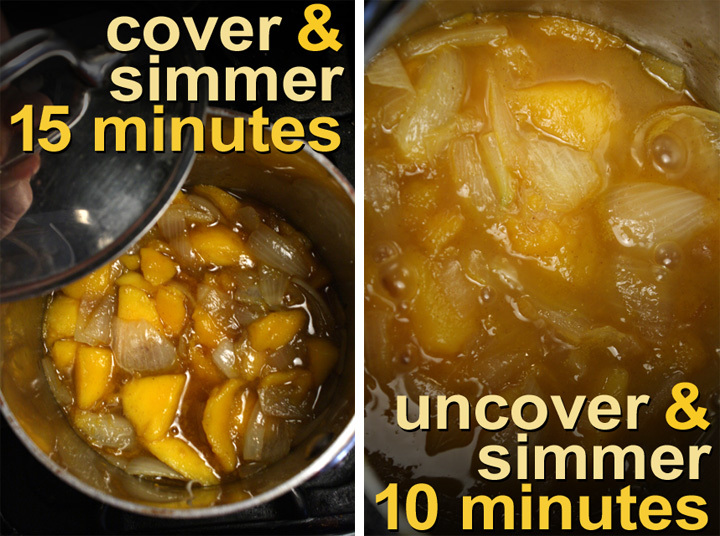 Uncover and cook until liquid reduced by almost half - about another 10 minutes. If you like a bit of liquid in your chutney, then just reduce cooking time. 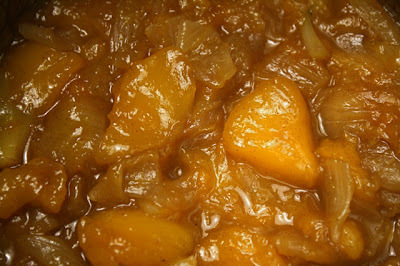 When done allow to cool, then keep Mango Chutney in the refrigerator until ready to use. It will thicken to a jam consistency as it cools down. Mangoes are expensive, so I did a minimal recipe. 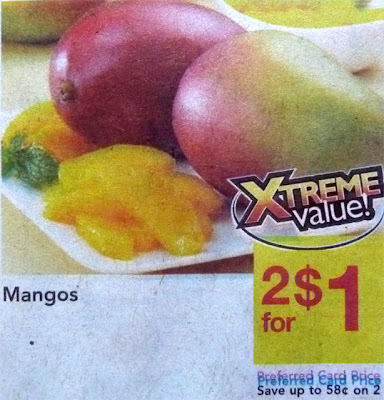 If you are using 2 large mangoes, you can add another onion, but I would not add any more spices or sugar and vinegar. 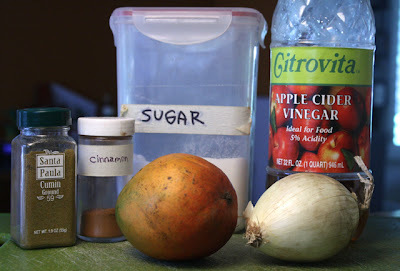 For 3 or more mangoes and onions, I would try about a 1/4 teaspoon more of spices, and a regular teaspoon of sugar and vinegar with each mango and onion you add. Most recipes load up with sugar, but this recipe uses half the normal amount -- you could even add less, mangoes are plenty sweet by themselves. A lot of sugar and vinegar is used for pickling and preserving, but don't worry this Mango Chutney won't last long!